But whether you call them “meditators” or the more grammatically correct “people who meditate,” the question still stands – who are these people? In the ‘60s, you could stereotype anyone who meditated as a hippie, and you were probably right. Not so today! The variety of people who practice Transcendental Meditation is as wide as the sky (literally; they circle the earth). You don’t have to be into spirituality to be into TM, or wear flowy clothes, or be from a certain religious background, or believe anything at all, really. The technique fits into any lifestyle. Some of the last people on earth you would typically expect to see meditating practice the Transcendental Meditation technique, and some of them have been practicing it for decades! Among them are the founder and president of the largest hedge fund in the world, Ray Dalio; NYC-based fashion blogger Madison Stephens; tech entrepreneur Blake Ian; pro soccer coach Alejandro Altamirano Sandroni; Jerry Seinfeld; and soldiers and veterans of the US Armed Forces. TL;DR There is no longer a “generic meditator” (if there ever was). 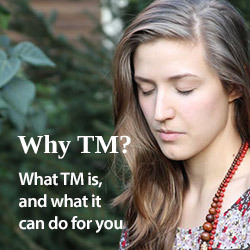 Transcendental Meditation is for anyone and everyone.